Indo Chinese Chilli Chicken is a nice saute of spices, sugar, sauces and boneless fried chicken cooked till perfection. This recipe is super easy to make and the result is just like any of your favourite Chinese restaurant. 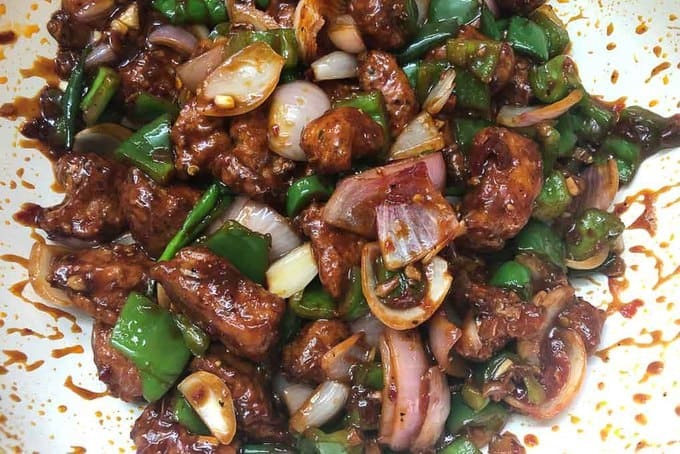 Check out the step by step and video recipe to make this spicy restaurant style Chilli Chicken and make this delicious recipe at the comfort of your home. Oh, and there is a secret ingredient to get that exact restaurant like taste that I have used in this recipe :). 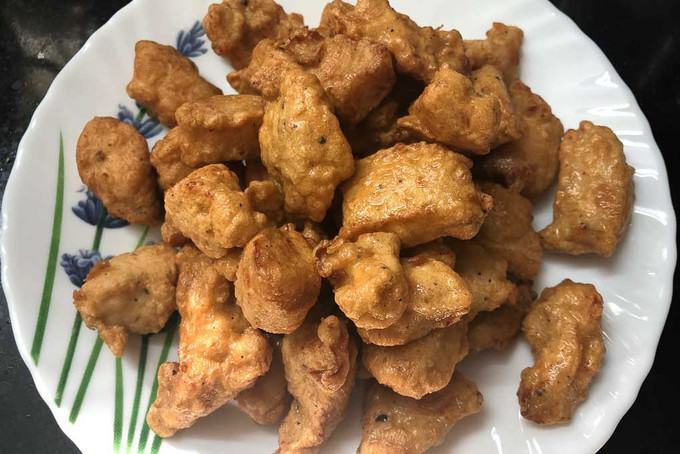 Do check it out 🙂 Here is how to make Chilli Chicken Recipe at home. Who doesn’t love a good Chinjabi dish? Full of flavours and quick to make, Indo Chinese is a favourite cuisine in my house too. 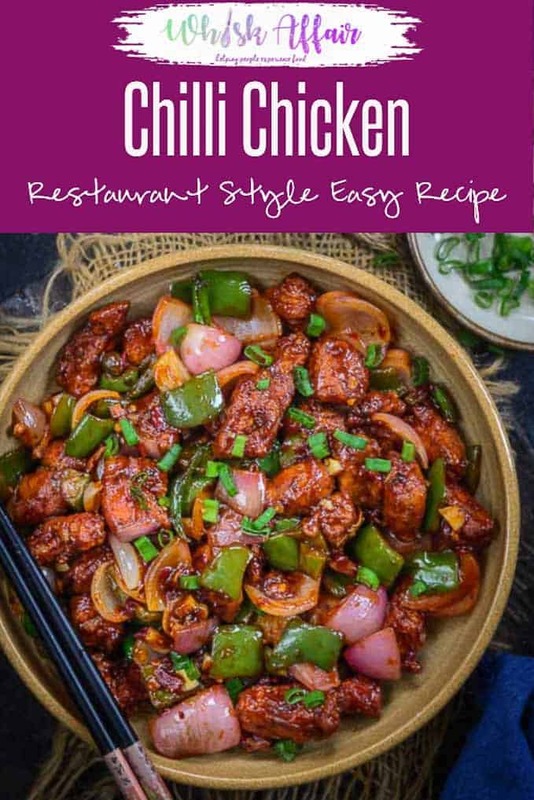 Essentially speaking, this restaurant style Chinese Chilli Chicken is a nice saute of spices, sugar, Chinese sauces and boneless chicken cooked till perfection. Chilli Chicken is Indo Chinese chicken starter that everybody loves and it’s one of the most ordered dishes’ at restaurants. What most people don’t realize is how easy this chicken snack is to make at home. And if you thought it’s not possible to get the same restaurant like taste at home, you were mistaken. Try out this Easy Chilli Chicken Recipe and you will thank me later. Hint hint – There is a special ingredient that makes this recipe just like your favourite take away. Read more to know about it. This chicken is crunchy from the outside and coated with oodles of flavour. There is just enough sauce to coat the chicken well and the sauce is a sensational mix of sweet, spice and everything nice. Despite trying out Chilli Mango BBQ Chicken, Chilli Garlic Chicken earlier, this Dry Indo Chinese Chilli Chicken Dry turned out to be their tastier version. Though used chicken in this one, if you are a prawn fan then feel free to try out Dry Prawn Chilli as well. This recipe uses the very basic ingredients which are generally available in the pantry. To cook the chicken, I have used all purpose flour, cornflour, ginger garlic paste and some dark soy sauce. 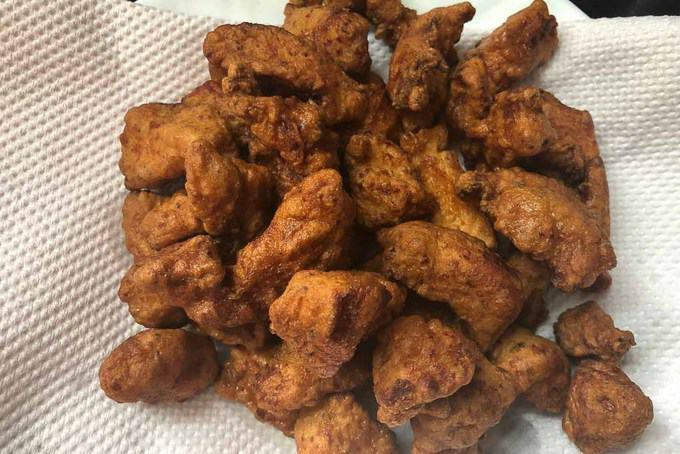 the marinated chicken pieces were fried in vegetable oil. For the sauce, I have used a lot of chopped ginger, garlic and green chilli. You can reduce the amount of green chilli if you don’t want your chilli chicken too hot. Apart from these, the basic Chinese condiments like Soy Sauce, Vinegar, Ketchup etc goes into it. I use a secret ingredient that takes this dish a notch higher. There is one ingredient that makes this recipe just like your favourite take away and that is Red Chilli Paste. Red Chilli Paste adds a nice punch of flavours and a spicy kick to this dish and takes it a notch higher. 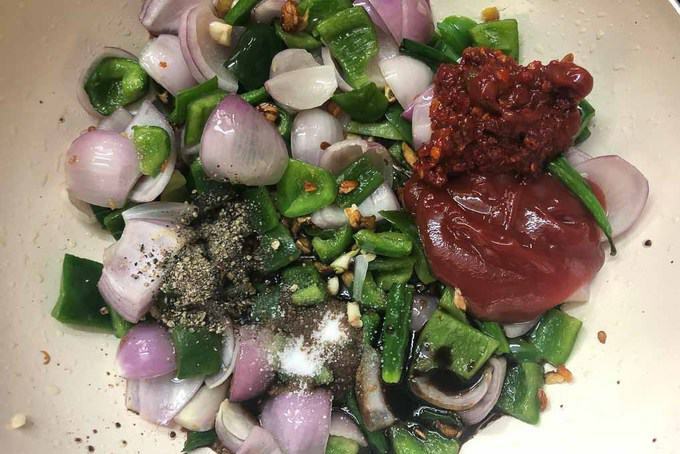 You can either use a ready made chilli paste or use this super easy recipe to make your own at home. The flavours of the chilli chicken really come through in this recipe and it’s a great recipe to try out at a party or get together. It’s one dish that goes quite well with most other Indian dishes and drinks. What is the best way to serve Chilli Chicken for parties? If you plan to serve this Chilli Chicken for parties, I suggest frying the chicken and keeping it aside. Keep the ingredients for the sauce ready. Once you are ready to serve, just make the sauce and toss the fried chicken pieces in the sauce quickly. After tossing the chicken in the sauce, serve immediately. 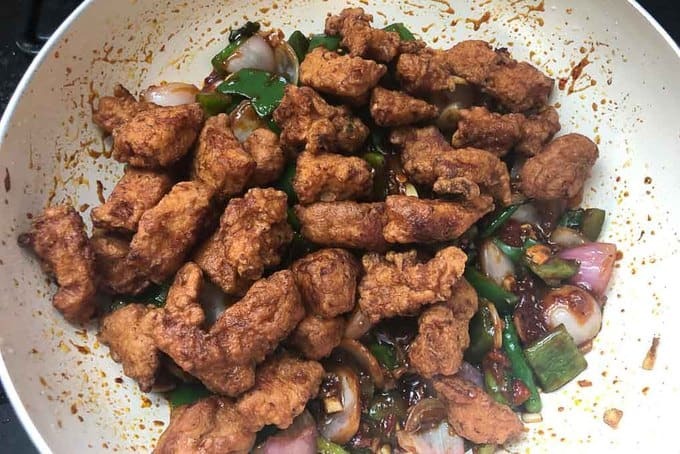 How to make Chilli Chicken Crispy? I use double frying method to make my chicken pieces super crispy. Coating the chicken in Maida and cornflour and then frying once on medium heat so that the chicken is cooked through and then frying it a second time on high heat makes the chicken quite crispy. Do not coat the fried chicken in sauce until you are ready to serve. 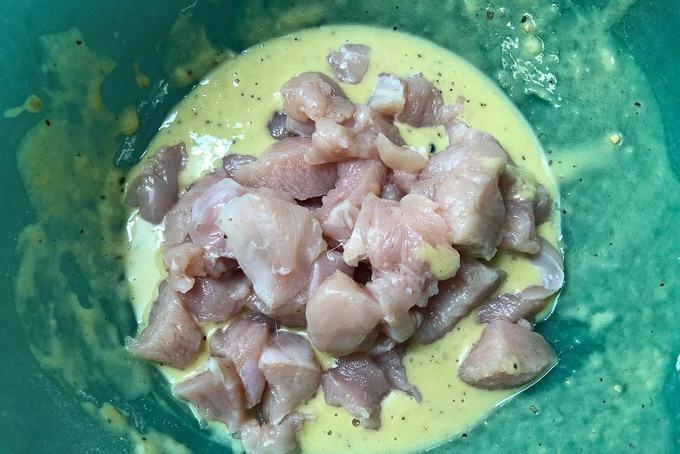 I recommend frying the chicken too at the time of serving, but if you are pressed for time, you can fry and keep it aside and then quickly coat in the sauce once ready to serve. To make Chilli Chicken with gravy, fry the chicken as mentioned in the recipe. Make the sauce as mentioned in the recipe. 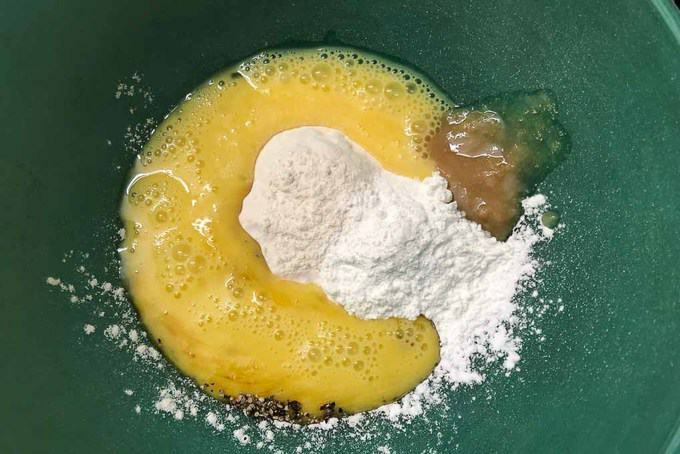 Mix 2 tbsp cornflour with 1/2 cup water and add the slurry in the sauce and cook until the sauce thickens. Now add the fried chicken pieces in the sauce and mix to coat them well. Serve this Chilli Chicken with gravy along with fried rice or noodles. How to make Kerala Style Chilli Chicken? 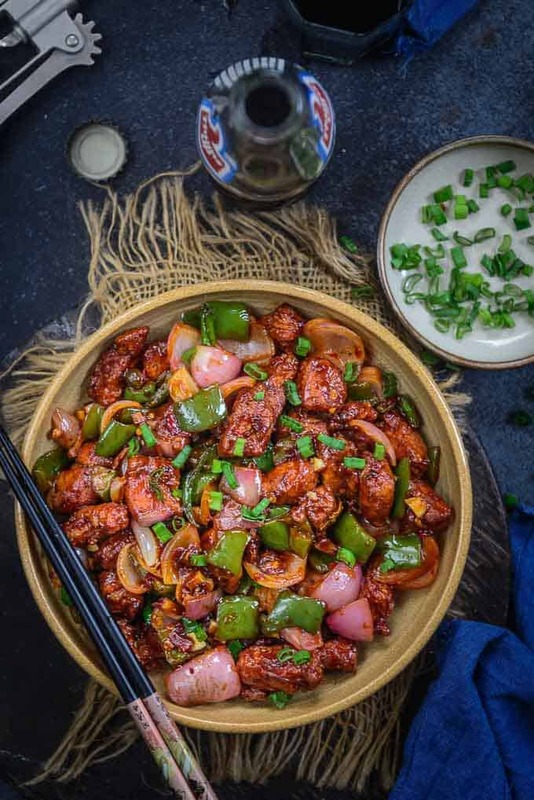 There is another version of this Indo Chinese Chilli Chicken and that is Kerala Style. This recipe is very different from the Indo Chinese one and use no Chinese Sauces but Indian ingredients like Curry Leaves, spice powders etc. It is more of a chicken stir fry but tastes delicious. To make it marinate the chicken pieces with ginger garlic paste, salt, 1 tsp vinegar, 1 tsp Kerala Garam Masala, 2 tsp red chilli powder and 1 tsp coriander powder and keep aside for 15 minutes. Add this marinated chicken in a pan and cover and cook for 15 minutes. Heat 3 tbsp coconut oil in another pan. Add 1 tsp mustard seeds and 10-12 curry leaves and let them crackle for a few seconds. Add 1 cup chopped onion and fry until slightly browned. Now add 1/2 cup chopped tomatoes, 5-6 slit green chillies and 1/2 cup cubed capsicum and cook for 2-3 minutes. Add cooked chicken and mix well and cook for another 3-4 minutes. 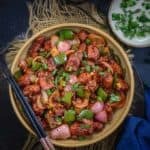 What to serve with Chilli Chicken? This dry version is served best on it’s own as an appetizer. If making a gravy version, you can serve it with Hakka Noodles or Fried Rice. It goes well with even plain rice. 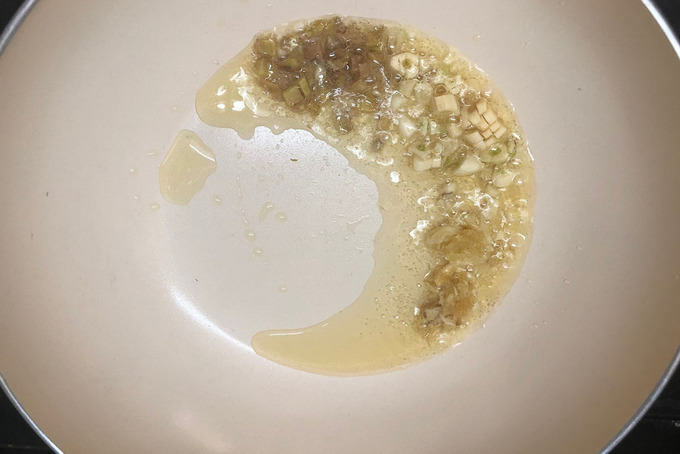 Mix all the ingredients for the marinade in a bowl. Add chicken pieces and mix well. Cover and keep aside for 30 minutes. Heat oil for frying in a pan. 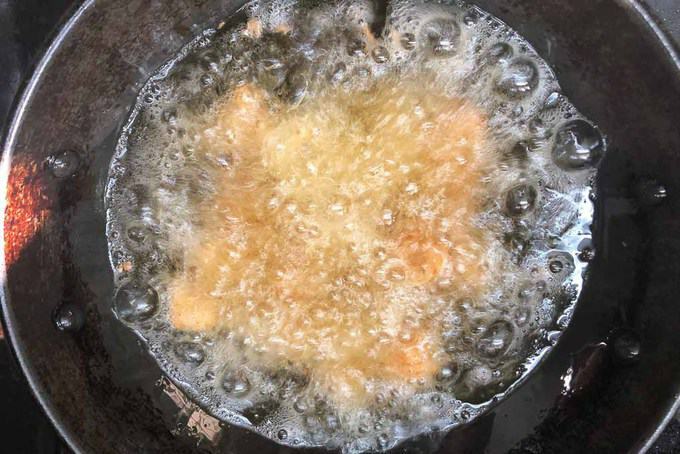 Once the oil is hot, add chicken pieces and fry on medium heat until slightly browned. Fry the chicken in 2-3 batches. Take out the fried chicken pieces on a tissue lined plate. Now heat the oil once again until it is very hot. Fry the chicken second time on high heat until they are nicely browned. Drain on a tissue lined plate and keep aside. For the sauce, heat vegetable oil in pan. 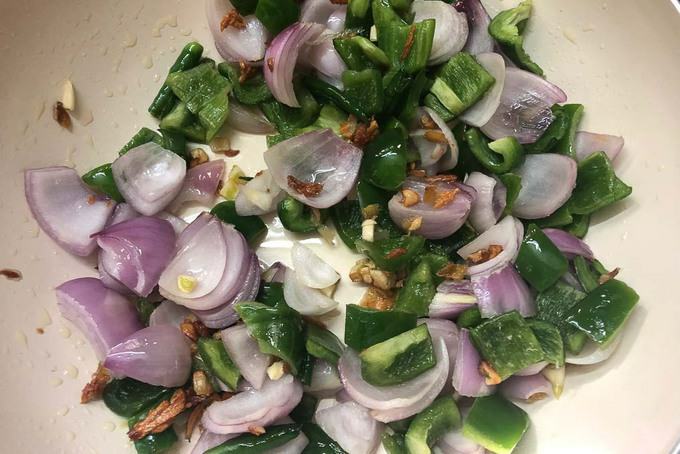 Now add onion, green chilli and capsicum and fry for a minute. Next up add soy sauce, vinegar, tomato ketchup, red chilli paste, salt and black pepper powder and cook for a few seconds. Finally add the fried chicken and quickly toss in the sauce. Essentially speaking, Indo Chinese Chilli Chicken is a nice saute of spices, sugar, sauces and boneless chicken cooked till perfection. 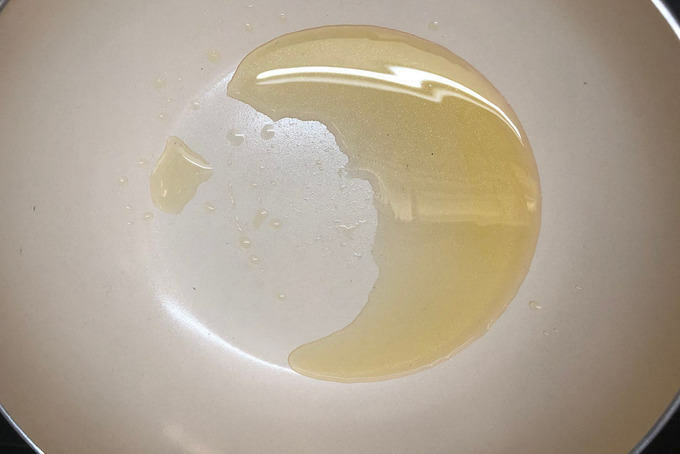 Heat oil for frying in a pan. 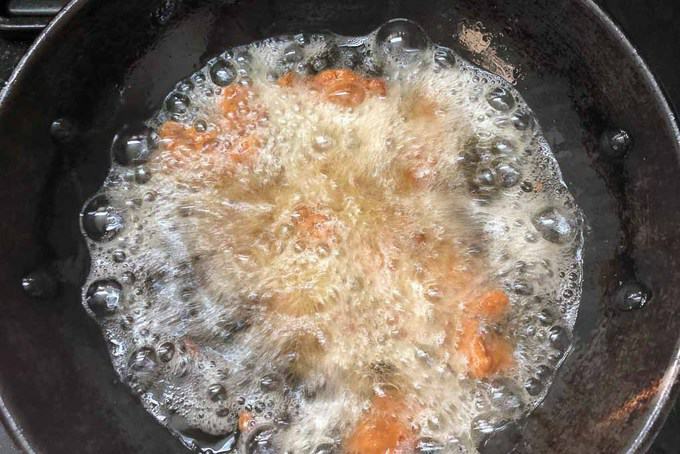 Once the oil is hot, add chicken pieces and fry on medium heat until slightly browned. Fry the chicken in 2-3 batches. Take out the fried chicken pieces on a tissue lined plate. Now heat the oil once again until it is very hot. Fry the chicken second time on high heat until they are nicely browned.